Access Handling are pleased to be introducing the new, all electric, “E-Moffett” to users of forklifts in Scotland. 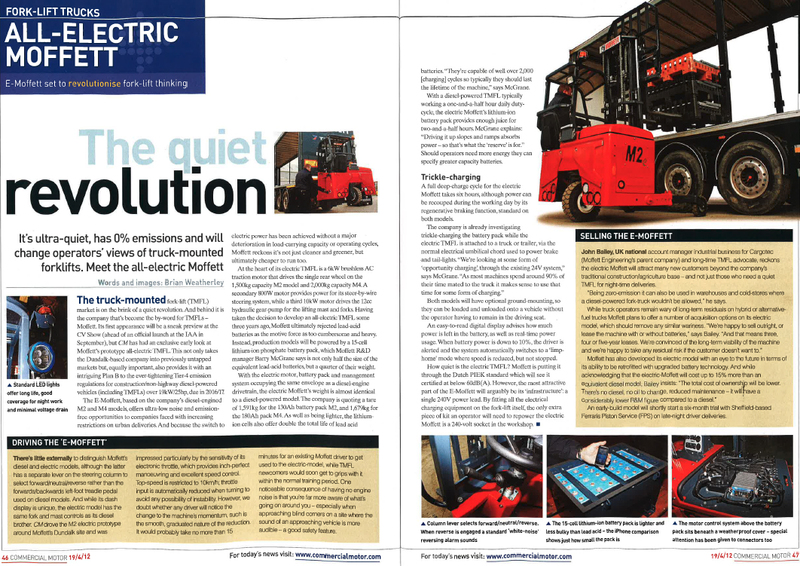 As featured recently in Commercial Motors magazine, this brand new electric truck mounted forklift has an ULTRA LOW NOISE ENGINE. The E Moffett forklift also has ZERO EMISSIONS, making it a very attractive fork truck for companies facing ever increasing restrictions on urban deliveries. Want to know how the new all electric E-Moffett can help your business?” – There are many benefits available to you when you choose the E Moffett, here are some of the main ones…. The E-Moffett meets TIER-4 emission regulations for construction and non-highway diesel powered vehicles. The E-Moffett offers ultra low noise and emission free opportunities to organisations faced with environmental noise and pollution restrictions in urban areas. Batteries for the E-Moffett are capable of well over 2000 cycles and should last the lifetime of the forklift. A full charge should give the E-Moffett forklift enough power to last 2.5 hours – even driving up steep slopes and ramps. 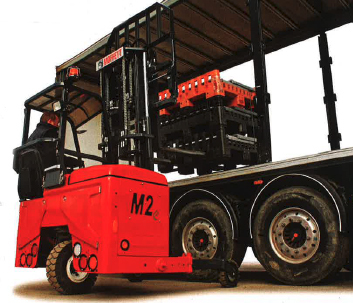 Ground Mounting: All the E Moffett truck mounted forklifts can be equipped with ground mounting so they can be loaded and unloaded onto a vehicle without the operator having to remain in the driving seat. No other charging equipment required. All charging equipment will be mounted on the forklift itself. The only other charger you’ll need is a 240v plug in the workshop! Frank Doyle, Director at Access Mechanical Handling and our expert in Moffett truck mounted forklifts believes that this new E-Moffett will be attractive for many new customers throughout Scotland – and not just those who need a truck mounted forklift for night-time deliveries. “Being zero emission, the E-Moffett can also be used in warehouses and cold-stores where a diesel-powered forklift truck wouldn’t be allowed,” he says. You can view more information about the full range of Moffett truck mounted forklifts and their wide range of applications under the products menu of our site. If you’d like to find out more about how Access and Moffett can help you to make better use of your logistics and materials handling operation or would like to arrange a trial of a truck mounted forklift please feel free to drop us a line on our contact page or give us a call on 01698 745859. We’re here to help lighten your load. At Access Mechanical Handling we supply sales, hire and leasing on new and used forklift trucks. We supply a full range of gas powered forklifts, diesel powered forklifts and electric powered forklifts. We mainly supply forklifts to companies in the Glasgow and Edinburgh areas, including Kilmarnock, Ayrshire, Livingston, Dumfries and Galloway, Bellshill, Motherwell and Lanarkshire. However we can also offer our excellent service to companies in Dundee, Inverness, the Highlands, Aberdeen and anywhere in Scotland.